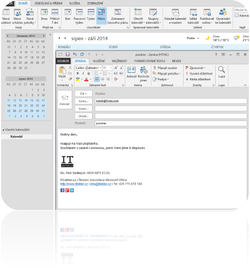 Microsoft Outlook is useful especially to organize e-mail, contacts, and events. With easy setup will create not only a meeting notice for birthday or holiday, but can also share tasks and calendar with other members of your team. Email messages will never be disorganized and through automated rules will themselves be placed into the appropriate folders. Let ITLektor show you the mysteries of this application. (Čeština) Online kurz Outlook – Efektivní správa pošty Sorry, this entry is only available in Czech.